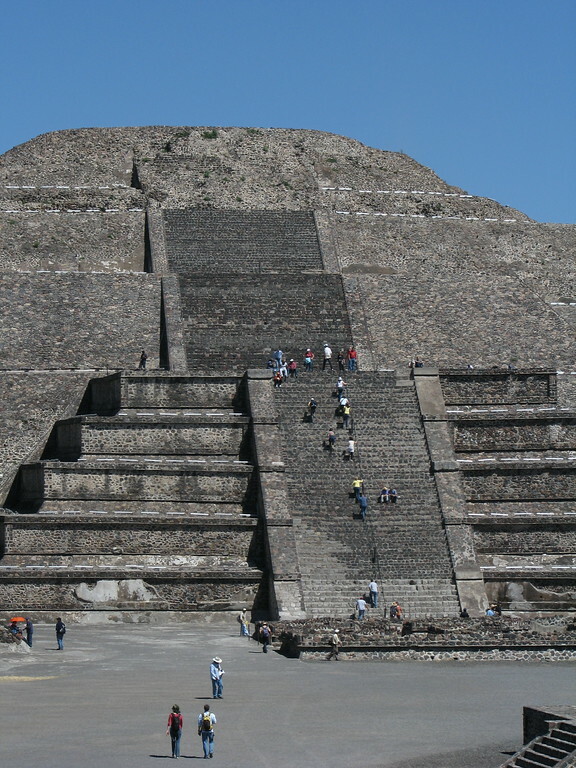 When you visit Mexico City, a must see site is nearby Teotihuacan. The stone largest pyramid in the Americas, the Pyramid of the Sun, and its neighbor the Pyramid of the Moon are the highlights of this massive archeological area. Unlike the taller Great Pyramid in Giza, you can climb this pyramid. 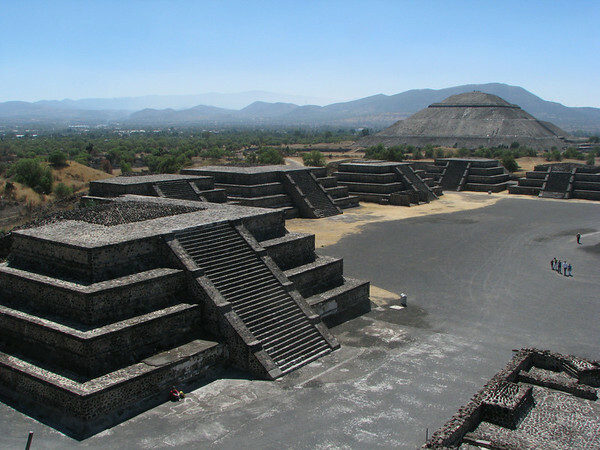 What are the highlights of Teotihuacan? The two pyramids, dominate a landscape of smaller temple pyramids arranged along the Avenue of the Dead (“Calle de los Muertos”) which is a mile and a half long. The name comes from the mistaken impression that the low buildings along its sides were tombs. Who built Teotihuacan? How old is Teotihuacan? We don’t know who built Teotihuacan. It was built starting around 300 B.C. and was in ruins by the time of the rise of the Aztec people more than a 1000 years later. When they saw the scale of the pyramids they thought it must have been built by giants. The names we have for the Pyramid of the Sun and the Pyramid of the Moon come from the Aztecs with their original names also lost over time. 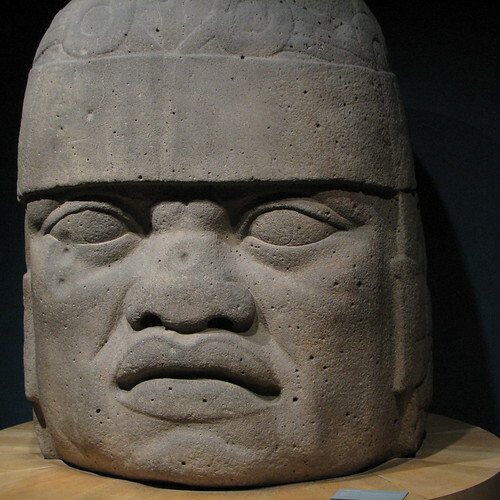 The name Teotihuacan also comes from the Aztecs and means something like “place of those who have the road of the gods.” It was thought, by the Aztecs, to be the site of creation. The city is estimated to have had 100,000-150,000 inhabitants and covered around 8 square miles. That makes it the largest city in the Americas before the 1400s and one of the largest cities in the world at its peak between 100 A.D. And 650 A.D.
Not all of this is excavated but it is still a very large site. Plan on walking… a lot I explored it on my own for 6 hours and went through 6 liters of water on a beautiful but not particularly hot day. Also remember that Mexico City is at 7,000 feet in elevation and Teotihuacan at 7,482 feet. So if you climb the pyramids, and you should, you will be doing this at altitude. Don’t forget your sunscreen. 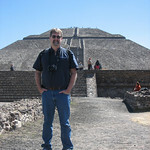 Should I book a tour for Teotihuacan? I visited Teotihuacan on my own. I got their via public transportation which is the cheapest way to visit. Becky from The Girl and Globe has a great guide on visiting on How to Visit Teotihuacan Without a Tour by Public Transportation. 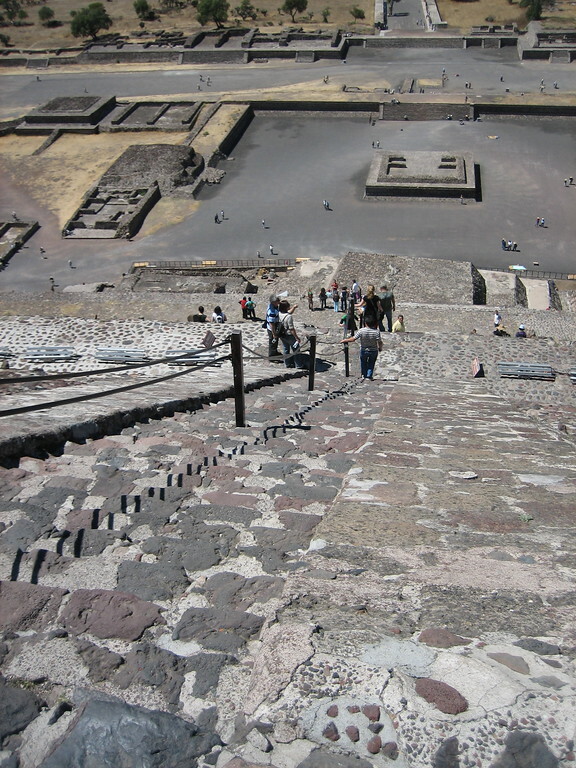 If I had to do it again, I would take a tour of Teotihuacan. 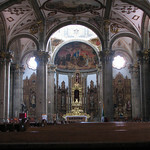 While I had no trouble touring it on my own, I did not learn as much as I would have, had I had a knowledgeable guide. 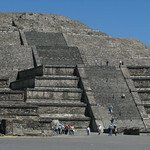 Tours are not that expensive, see: A Private Tour: Teotihuacan Pyramids Day Trip from Mexico City with an Archeologist.